Our graceful FLOTUS Michelle Obama made us proud yesterday as she spoke for the commencement of the 2012 Democratic National Convention! 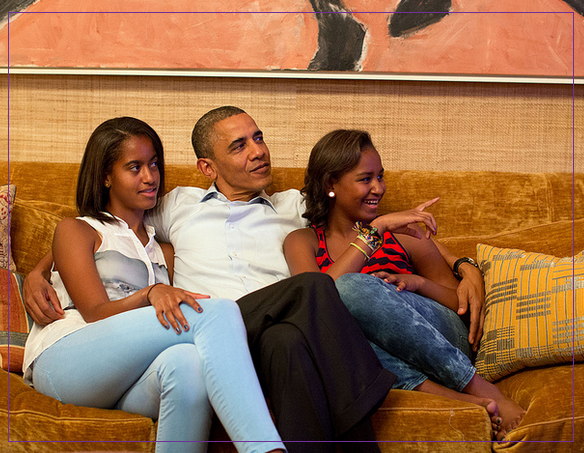 Her husband and beautiful daughters Malia and Sasha watched her proudly on television as captured above. Mrs. Obama was poised and direct in a fabulous Tracy Reese sleeveless dress. Sharing personal stories about how her husband's character throughout his term has not wavered. She spoke of President Obama as a great father, a great husband, and an overall great human being who knows the struggles of everyday people because he lived them. She always gives great speeches and Im sure the president is so proud of her! What I loved mostly is that she never mentioned the opponents. She kept her speech about her husband and his character and how a man of his standard is what this country needs! The entire event was dynamic. All of the speakers reinforced all that has been accomplished in the last 4 years and had fun while doing it! A few others stood out last night. Mayor of Newark, Corey Booker got everyone fired up! Mayor Julián Castro of San Antonio, Governor of Massachusetts Deval Patrick, and Governor of MD, Martin O'Malley each gave incredibly moving and informative speeches! I know you came for the the First Lady's speech, so hear it below & GO VOTE! I LOVE MY FIRST LADY; SHE DID A MARVELOUS JOB SPEAKING. LET US PRAY MUCH FOR THEM, AND IF YOU DON'T HAVE SOMETHING GOOD TO SAY ABOUT ANYBODY OR ANYTHING; THEN JUST DON'T SAY NOTHING! !